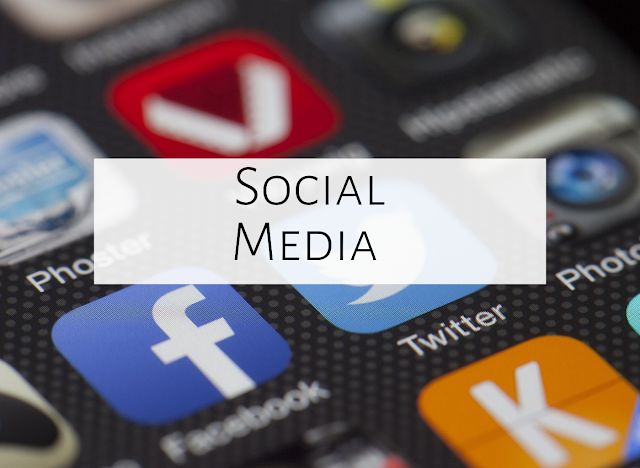 The way that social media is used has changed tremendously over the last few years. In the past, I used social media as a way to simply catch up on the lives of friends, follow celebrities, or look at pretty pictures. Although I still do those things, I'm now using social media as a form of professional development. 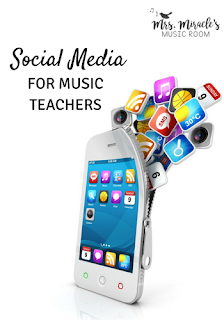 In this blog post, I'll detail how to use social media to learn from other music teachers, gather ideas, and even learn new songs! When I first happened upon Pinterest, I found tons of pins about home decor and women's fashion, and I wasn't all that interested. 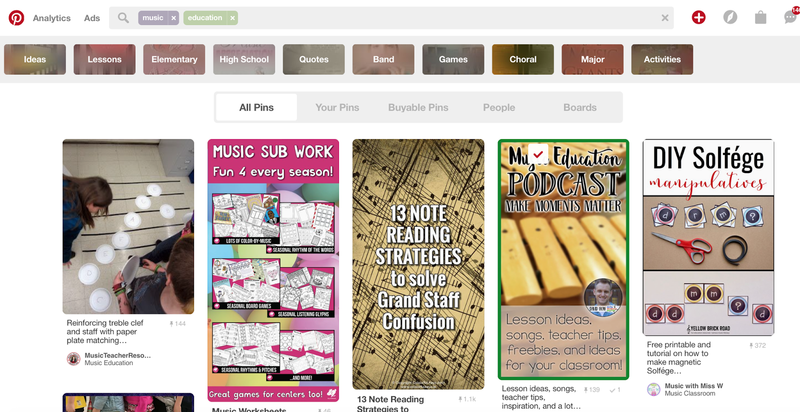 But then I discovered pins about education, and specifically music education, and I was hooked! When you click a pin, it takes you to that blog post, article, etc. To see a sample of other great pins I've discovered over the years, check out these "Favorite Pins of the Month" posts. To follow me on Pinterest, click here. For more information about how to use Pinterest, see this post. 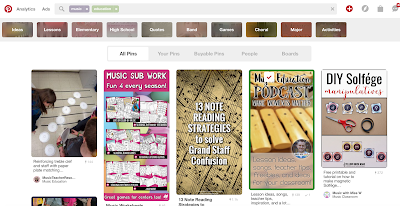 Lindsay Jervis also has a great post about music education pinners to follow here. I also recently started the group "Mrs. Miracle's Chat Room," in which we discuss different topics every day, like technology tips on Tuesday and stories, or picture books, on Saturday! Twitter used to be a bit of a mystery to me. I just didn't get it. 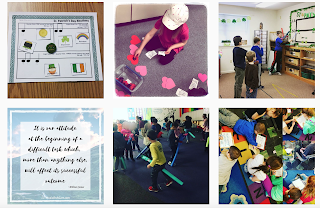 But after playing around with the platform a bit, I started to finally figure it out...and it can be a great way to share articles and blog posts....and with the #elmused chat every Tuesday evening at 9 pm eastern, it can be a wonderful way to gather ideas! To join the #elmused chat, go to Twitter Tuesday evenings at 9 pm eastern, and search #elmused, then click "all tweets." If you're not completely comfortable with Twitter, you could just watch the chat to see how it works. If you want to join, just make sure to answer questions with A1 for the answer to the first question, A2 for the second question, etc., and add #elmused to the end of each tweet! 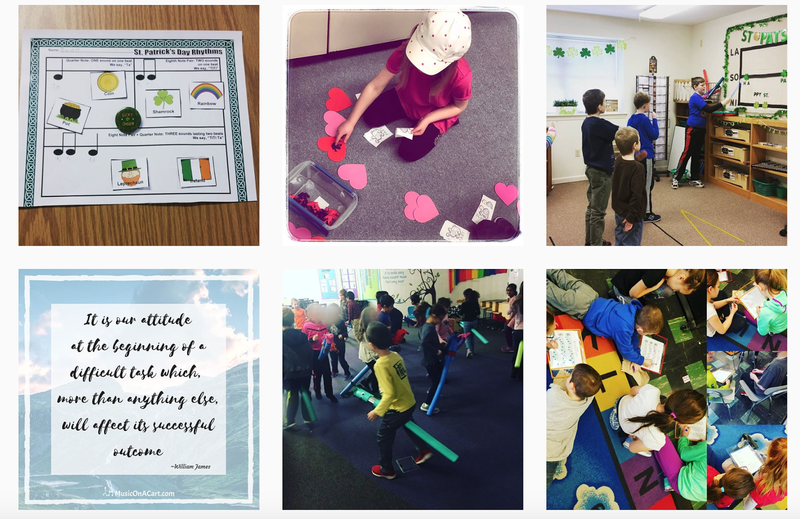 Instagram is such a fun way to scroll through beautiful pictures, but recently, I've seen so many more music teachers post pictures of their classrooms, their activities, etc.! 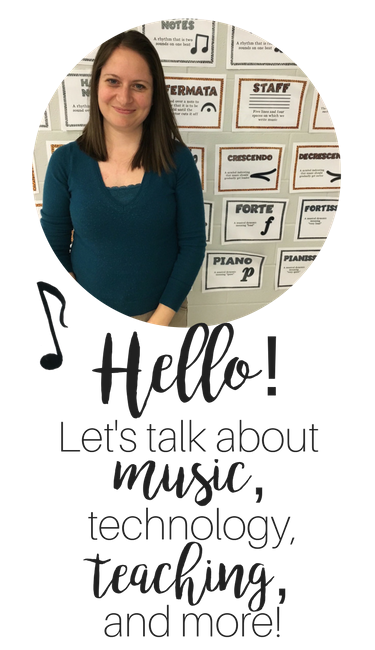 YouTube can be such a great tool for the music classroom! I've been frustrated in the past, though, by the commercials on YouTube, as sometimes they are NOT appropriate for students' eyes. I have found a great extension to help with this, though! On Chrome, install AdBlock for YouTube, and then make sure to open up YouTube with Chrome....and NO MORE ADS! So exciting! YouTube can be a wonderful way to share performances with your students. Instead of just listening to a recording, you could have students watch a performance by searching for a piece of music on YouTube, and then finding an orchestral performance. Looking for new folk songs? Check out Robert Amchin's YouTube channel, which is FULL of folk songs, as well as teaching strategies! Looking for tutorials about long-range planning? Check out my channel, which has tutorials about creating year plans, song lists, and more! One of my favorite ways to use YouTube is to research and learn folk dances. To search for new dances, you could search for something like "Italian folk dance" and see what you find. I like to use the app SoundHound to discover the titles of unknown songs, especially if they aren't listed in the video description. Here is a post with a few YouTube videos, containing folk dances/ singing games. Whether you dive further into Pinterest or check out videos on YouTube, I hope this post has been helpful to you. Are there any other platforms or ideas that I didn't mention? Feel free to comment below, and have fun on social media! Thanks for the great ideas! These are some great examples of using technology to help with teaching music. Thanks for the social media article!